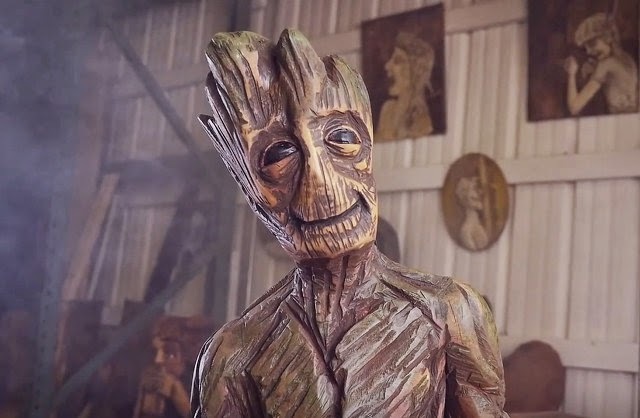 It may only be mid-October, but let's face it, this year went to Groot. Sure the dude only had one line (and a pretty sweet set of dance moves), but you'd have to be huger than Harley Quinn to out-do the environmentally friendly Guardian of the Galaxy at this point, and between now and the end of December, I just don't see that happening. So it makes complete sense that Gifton Ramsey would take the time to chainsaw up a few tree stumps and turn them into the big lug. She also elaborates on how she turned a life of going against the grain into producing timber art, and takes you step by step through the process. Now it just needs to be hollowed out and speakers put in so we can Ooga Chaka around it. Halloween is coming Random - would fit with the season! One of these days one of us is going to be rich, and I shall mail a list of all the awesome ideas we had "when" to them. Unless it's me. Then I'll just put out a press release and invite you all to the party.